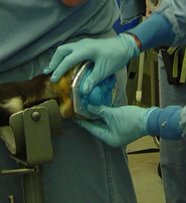 Barbaro's "good" foot is shod with a glue-on double hospital-plate support device. Photo © Rob Sigafoos. Many thanks to Upenn Chief of Farrier Services Rob Sigafoos for sharing with us the first official release of photos and information on the shoe designed for Barbaro’s “good” foot. The good foot must be supported in an effort to prevent what is called “support limb laminitis”, caused by over-stressing the good leg during recovery from an injury in the opposite limb. While support limb laminitis is more of a risk in horses who injure the front legs, which bear more weight than the hind, there is still a risk of developing laminitis in the hind limb. According to Rob, who granted Hoofcare & Lameness his first interview on the case today, Barbaro was laid down on the surgical table around noon on Sunday, after being admitted on Saturday following his injury in the Preakness Stakes in Baltimore, Maryland. All the colt's race plates were pulled off by Rob and his feet were trimmed. Rob traced the left hind at this time, and went to work building a shoe to fit the tracing while Dr Dean Richardson moved the horse into the sterile surgical suite to begin surgery. Later that night, when the operation was finally complete, Rob returned to the surgical suite and met up with Barbaro again when he was removed from the sterile setting and the cast was applied to his injured leg. Rob glued the shoe on the left hind (“the good foot”) at that time, while the horse was laying down. The horse was then lowered via hydraulic sling into the recovery pool, where he emerged safely from anesthesia. The bottom layer is what is called by farriers a hospital plate. It is a 1/8” thick sheet of aluminum, cut in the shape of the foot, and is held on with four bolts that are threaded into the two bottom layers of the device. The “sandwich” layer is high-density polyethelene used as a spacer, followed by the second plate, also made from 1/8” high-grade aluminum, which attaches to the shoe, which is made from 3/16” high-grade aluminum, and is bonded to high-performance polyurethane, which is in turn bonded to Vectran/polyester braided fabric, which forms the “cuff” of the shoe. 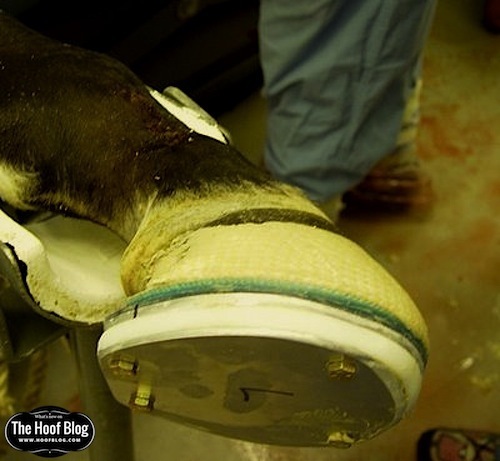 Thickened with adhesive, the Vectran becomes an artificial outer wall for most of the hoof and holds the shoe in place. A PMMA-type adhesive is used; in this case the commercial name is EquAcrylic. The spacer plate (white polyethelene) is used to equalize the horse’s limbs, so that they will be the same length and increase the probability that the horse will easily shift weight from one leg to the other and bear weight normally while standing in the stall. Rob’s secret weapon is the use of copper sulfate-impregnated silicon hoof packing. While no one is predicting that the horse will develop laminitis (according to Rob, the foot looked normal in conformation, with no visible evidence of past hoof disease), it is important to be pro-active. The hoof packing will keep the sole clean, in the event of laminitis. The hospital plates can be unscrewed and removed to check the bottom of the foot. If the horse does develop laminitis, the sole and frog will be accessible for medication and treatment without removing the shoe. 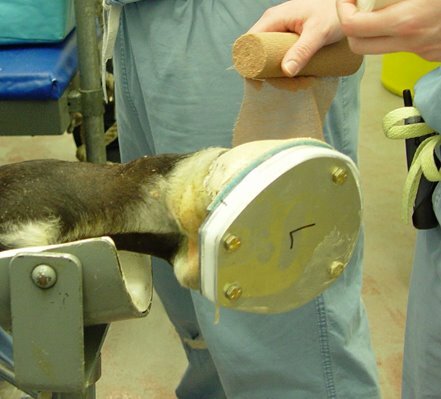 The wad of blue hoof packing will pop out of the foot once the hospital plate is removed. In addition to keeping the sole clean, the copper sulfate will toughen the sole as well. It will be carefully monitored. Shoeing to prevent support-limb laminitis in orthopedics cases is often a “Catch 22” situation, according to Rob. If the horse does not get laminitis, the shoe will not get the credit, the horse will, for standing on both legs. If the horse does get laminitis, the shoe design will be blamed—-it should be have shorter, taller, more support, different configuration, etc. Rob didn’t mention it, but the horse is probably also wearing support wraps on the good leg. In closing, both Rob and New Bolton Center farrier Laura Florence remarked on the media frenzy and the outpouring of support from the public. Delivery trucks are bringing cases of apples and carrots, and a wall of get-well wishes lines the highway outside the campus. This artwork was provided by Rob Sigafoos and New Bolton Center. In order to post it here, it had to be reduced in size and resolution. I hope you can still see it. My narrative post (see above) explains the layers and construction of the device. If you wish to contact Rob Sigafoos directly, and of course many people do want to, please DO NOT call the central switchboard at New Bolton Center. They are swamped with calls. To reach Bill Kirkpatrick at Sound Horse Technologies, manufacturers of the Sigafoos shoes and the other products used on Barbaro, please call call 1 800-801-2654 in the USA or 610-347-0453; fax: 610-347-1822 or email horseshoes@soundhorse.com. Text and photos © 2006 Hoofcare Publishing. Text and photos posted on “The HoofBlog”. Learn more (and subscribe online using our secure server) at http://www.hoofcare.com or write to Hoofcare Publishing, 19 Harbor Loop, Gloucester MA 01930 USA. Tel USA 978 281 3222; Fax 978 283 8775, or email hoofblog@hoofcare.com. 3) by being built up to extend the length of the left hind foot, which compensates for the additional length of the right hind limb created by the cast. The shoe used is a glue-on shoe designed and patented by the University of Pennsylvania, and has been in use for over 10 years. This shoe is a three-part device. Photos by Susan Hankin JD, MPH, courtesy of Rob Sigafoos. Text and photos © 2006 Hoofcare Publishing. Text and photos posted on “The HoofBlog”, a casual news source for subscribers and friends of Hoofcare & Lameness: The Journal of Equine Foot Science. Learn more (and subscribe online using our secure server) at http://www.hoofcare.com or write to Hoofcare Publishing, 19 Harbor Loop, Gloucester MA 01930 USA. Tel USA 978 281 3222; Fax 978 283 8775, or email fran@hoofcare.com. "Distal Limb Development and Effects of Shoeing Techniques on Limb Dynamics of Today's Equine Athlete" has been published in The Netherlands! 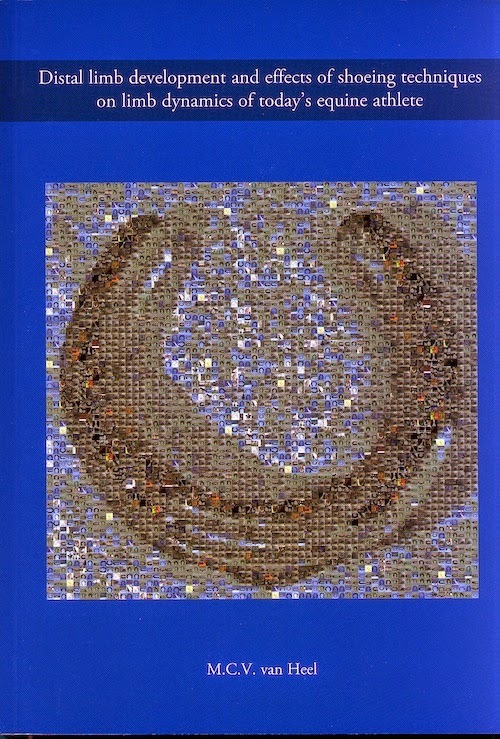 Dutch researcher Meike van Heel PhD has assembled her papers and dissertation on hoof balance into the pages of a lovely book. It is 174 pages, with color photos and art (though not enough of either). A landmark study of hoof balance and growth uses traditional and high-tech research modalities to bring new information to equine hoof science. Pressure mats, force plates, video gait analysis, radiography and keen observation of equine posture and behavior yield a document rich in the use of science to back up common sense. Studies examine the prevalence of uneven feet (so-called “high-low syndrome”). Documents how a horse compensates for hoof growth to maintain balance and how a rolled toe shoe aids in efficient movement and joint mechanics. Watch for Meike to be a lecturer at conferences later this year or next year. She will be consulting for Mustad on innovative development of products and trends from her base in Holland. Meike was a featured speaker at the International Conference on Equine Locomotion, hosted by Dr Hilary Clayton at Michigan State University in 2004. Her research was featured in an article on gait analysis and videotaping of horse movement in Hoofcare & Lameness #78. Note: Meike's book is no longer available for sale. If a new edition is printed, it will be announced on The Hoof Blog. Bachelor's degree in farrier science in the future? "As a result of the validation of both (these) courses, farriery is now recognized as a true profession alongside Doctors, Lawyers, Accountants and, heaven forbid, even Veterinary Surgeons" writes Myerscough College Senior Farriery Lecturer Mark Caldwell. Big news from England this week. Myerscough College and the University of Lancashire have announced a new program in advanced farrier science. The education system is a bit different in the UK, as compared to the USA, but this program will be open to US students and will also have some distance-learning components. It will be designed to prepare farriers to pass thet Worshipful Company of Farrier's Associates test, which is their mid-level of advanced farrier, followed by the Fellowship. We are waiting for the official paperwork on the course structure from the unversity. First of all, Mark says that there is no other program like this, anywhere in the world. "There is an amendment being put through UCLAN academic standards for the BFSc; this is available to USA students from September 2007, subject to qualification and the completion of bridging modules." he wrote to Hoofcare & Lameness in an email on 24 May. He is interested in collaborating with farrier education programs in the USA and other countries. "We are hoping to recruit some students from the USA and the practical sessions will be conducted during a month-long summer-type school," he writes. 1. The honors degree course, which includes the foundation degree, has been set up in conjunction with University of Central Lancashire as a modular route to the Worshipful Company of Farriers (WCF) higher examinations. Both courses have had the benefit of external academic advice from the WCF and are in fact supported whole heartedly by the WCF. 2. The content of both courses has been written by the course team which includes myself, Neil Madden FWCF and Major J. Reilly PhD, BVSc, MRCVS and has followed the WCF higher examination syllabi. 3. The foundation degree is a distance learning course incorporating periodic college attendance (currently 2 days per month during college semesters) and encompasses anatomy and physiology, equine biomechanics, pathology of diseases, dynamic gait analysis, teaching and assessing, lameness evaluation and diagnostic imagery, employment and health and safety regulations pertaining to small business as theory modules delivered through on-line format. Practical subjects, including shoemaking, shoeing for pathological diseases, farriery protocols and shoeing with modern materials, are taught during the monthly workshops on campus. 4. 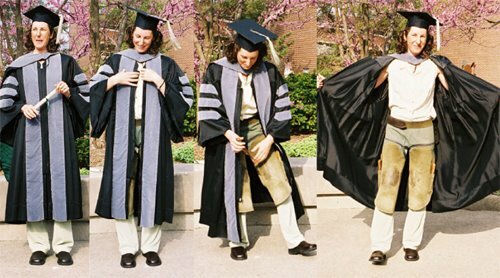 The honors degree includes a double dissertation module (10,000 words), corrective farriery for juveniles, verification and examination techniques and business planning modules. 5. All modules are assessed in part by course work and substantively by end-of-module examination. These examinations follow closely those currently set by the WCF with the final practical examination (similar in format and content) monitored by WCF examiners. 7. Both the foundation degree and honors degree are validated by the university academic standards committee and have the approval of the WCF. Both courses allow the candidate, subject to the pass grade of 60%, to apply to the WCF for either the AWCF, in the case of the foundation degree, or the FWCF in the case of the honors degree in the same way as the current military B2 or B1 allow for the diploma and associate awards. Candidates that fail to reach the 60% mark will have to sit the WCF examination separately. 8. Both courses are designed with the express intent of maintaining the WCF integrity as guardian of the standard of craftsman ship whilst recognizing the science of farriery on a formal academic basis in line with the veterinary profession. 9. The foundation degree is only open to registered farriers who hold the WCF diploma or recognized equivalent, currently the American Farriers Association CJF. The honors degree will only be open to holders of the foundation degree or WCF Associate award. Those students only holding the associate award will be required to undertake 4 bridging modules before starting the honors degree in order to prepare them for the academic rigor of level 3 degree study. More details are available in Hoofcare & Lameness Journal, issue #80. No link to further information is currently available via the Internet. Can't get enough Barbaro? More links! This is getting a little lengthy...but some people want to read it all. So here you go! I am updating this regularly, with the most recent links at the top. Maryland track officials analyze slo-mo video of injury from all angles, think they are 80% sure that Brother Derek and Barbaro had contact leading to injury. Great essay about weightbearing and recovery after surgery with quotes from JD Howard DVM, the vet who worked with Nuryev after his leg surgery. The New York Times of 29 May gives balanced coverage to charges of vet error or assistant starter incompetence in the search to understand why the colt broke down. Includes a letter from a Montana veterinarian and his charges. "Human intervention has been so pervasive that on some level these are scarcely horses any longer but centaurs, part equine and part human, their lives so intermingled with ours that there is no separating the two." --From "Our Creation, Our Concern: Equine Evolution", a critical essay by Linda Greenhouse published in the 28 May Sunday New York Times. An interesting aside: the author is the Times's Supreme Court reporter. I have some great news about Buster (Conklin), he seems to be recovering! I just spoke with him and he sounds much better. He had a doctor appointment today and his bilrubin count is down and the doctor is quite confused why he is showing signs of recovery. Apparently you all have done your job well by calling him, sending cards, and praying. He thanks you all for the support that he has received. We all thought he had one foot in the grave last week, but miracles do happen. He is not out of the woods yet, but for now the outlook is better. He could have a recurrance because his liver is still damaged, but right now he is on the mend. Don't forget about him. Note: Buster Conklin is a senior farrier and former resident farrier/insructor at Cornell University College of Veterinary Medicine. He has a lot of friends and supporters all over the world who will be happy to hear this news. KENNETT SQUARE, PA – An anonymous donor has given a very generous gift to launch the Barbaro Fund for the George D. Widener Hospital at New Bolton Center. Due to the overwhelming outpouring of support for Barbaro, the University of Pennsylvania’s School of Veterinary Medicine has also established a website where people can send messages of support for Barbaro and where donors can offer their support for animals treated at New Bolton Center. Donations will go directly to a fund for the Widener Hospital and not specifically for Barbaro’s care. Donors can find out how to offer monetary gifts at: www.vet.upenn.edu/giving/giving_ways.html. Well-wishers can send e-mail to Barbaro via a form at: www.vet.upenn.edu/barbaro. That was the full-page headline on one of the New York tabloids on Sunday. Major surgery on Barbaro began at 1 p.m. this afternoon and ended at approximately 7 p.m. 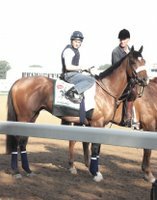 According to orthopedic surgeon Dr. Dean W. Richardson, the operation went satisfactorily and Barbaro is in his recovery stall. "Barbaro presented with a case that was about as difficult as such an operation could be," said Richardson. Barbaro had fractured his leg in three places. During the surgery, the bones were set and will be allowed to fuse in place over time. Recovery will take many months. "While we do not anticipate complications, surgery is only the beginning for a horse that has undergone major surgery," Richardson said. "We are optimistic, but right now we are focusing on Barbaro's recovery." Dr. Dean W. Richardson is Chief of Surgery and the Charles W. Raker Professor of Equine Surgery at Penn Vets Widener Hospital at New Bolton Center. He is an internationally recognized orthopedic surgeon whose research focuses on cartilage repair. Dr. Richardson has been part of New Bolton Center since 1979. RUFFIAN: Is Reality Imitating Art Imitating Reality? I am sure I am not the only one who thought of Ruffian and Go for Wand (and many others) while watching the Preakness drama. I was in front of a television at a country inn in New Hampshire with farrier instructor Mitch Taylor, SNEFA president Sean McClure, Mitch's lobsterman cousin, and a vet student from St George University in Granada. We had just finished an anatomy lab at the Myrhe Equine Clinic in Rochester, NH. Oh, and the bartender, who was a dressage rider. Just think, you only have to wait one year and ten days to re-live the horror of a horse breaking down.ESPN's made-for-tv film "RUFFIAN" will be based on the true story of one of the most beloved (and ill-fated) racehorses of all time. 1975 champion filly Ruffia broke down during a match race against champion colt Foolish Pleasure at Belmont Park in NY. Rufffian re-broke her leg after surgery and was euthanized. Some of us have never forgotten that day. The film will be shown on ABC on June 4, 2007 and will star Sam Shepard, one of my favorite actors. About nine p.m. tonight, Barbaro was announced to be resting in a recovery stall. Hooray! Check your favorite news source--In addition to ESPN and CNN, I also recommend msnbc.com or abcsports.com, and the New York Times, although many of their Barbaro updates have been restricted to subscribers (grrrr). The media frenzy surrounding this horse may be good or bad for the sport and for the public's perception of veterinary medicine's ability to save a horses from death (or not). Let's hope that all goes well and the press stays on the story for a while, rather than disappearing now that the horse is over what will surely be only the first of several hurdles. Note: we later learned that the correct count of screws was 27, not 23 as stated in this article. By now, everyone knows that 2006 Kentucky Derby winner Barbaro broke down in the Preakness Stakes today. As I write this, he is being transported to the University of Pennsylvania's veterinary teachning hospital outside Philadelphia, where he will be examined and plans made for surgery to repair his broken hind leg. Or, worse case scenario, he will be euthanized. Gretchen Jackson is co-owner of Barbaro, with her husband, Roy. They live right down the street from New Bolton Center, the large animal hospital and research facility in Kennett Square, PA, where their horse is tonight a patient. New Bolton is not far from Pimlico but the trip must have been tough for the horse and his human connections. I wrote about the great stallion Nureyev years ago at Walmac International in Lexington, KY. He shattered his right hind leg below the hock in a paddock accident. He was a very smart and cooperative horse and survived surgery and recovery to become one of racing's all-time leading sires. Nureyev lived in a sling in an extra-long stall for months. Of course, he was not racing-fit at the time of his accident. THE Queen's former farrier was today to be honoured with a parade of police horses along Princes Street as he was presented with an award for his work in animal welfare. Lothian and Borders Police horses in full livery were due to assemble at The Mound to celebrate Donald MacNaughton receiving his Animal Champion award from the Scottish SPCA. Mr MacNaughton, 60, has worked with the force's horses for 32 years. Born in Liberton, he joined the Royal Army Veterinary Corps as a young man and trained as a farrier. He was later responsible for tending to the Queen's horses in London before moving back to Scotland. Inspector Jim Baird of Lothian and Borders Police Public Order Unit said: "Thanks to Donald's skill and dedicated care, our horses lead long, productive lives." This just in from Steve Kraus, regarding the health of our good friend Buster Conklin, New York state farrier and retired farrier instructor at Cornell University College of Veterinary Medicine. "As of today he is doing a little better and is home. He still is in a fragile situation and no one knows what the time table is but we are are still thinking that he can't live very long with his liver condition, but maybe he will fool us! As I've said, he will choose his own time. They don't make guys like him anymore. He still has some drain tubes in. He has a doctor appt. on Tues. to see what the next step is. He likes hearing from his friends so don't be bashful. Joe Chicone gave him a haircut the other day. His color comes & goes. I'll keep you all posted every several days. Let me know who else needs to be sent messages, I'm not trying to leave anyone out, its difficult to find all the addresses." Scroll down a few posts and you will find the address and phone number to contact Buster. Thanks for keeping him in your thoughts! Four shoes by British racing champion filly (and US Breeders Cup winner) OUIJA BOARD are up for auction for charity this week on eBay. So far, the bidding is up to just under $1000 with the latest bid from "Lady Tavistock"--who knows if it is the real Lady Tavistock or an imposter, but that is part of the fun of eBay! Ouija Board is still in training and seems to be circling the globe, racing in major stakes from Dubai to the Pacific Rim this year. The shoes were donated by the Countess of Derby. Who Has the Right to Put a Horse Down? This is a strange story: one of the UK's leading race trainers is being prosecuted for putting a horse down. The horse was suffering from a severe leg infection following a breakdown in a race. Apparently, the Royal Society for the Prevention of Cruelty to Animals believes that that is the attending veterinarian's call, not the trainer's. This is not the first story of this type I've run across. A story from Australia comes to mind, in the reverse: a horse owner was struggling for the right to keep a horse alive, while veterinarians insisted the horse be put to sleep. These stories bring up challenges to laws and traditions and many people's beliefs in what constitutes suffering and a horse's right to be free of pain. Follow this link, read this article, especially if you are a veterinarian. 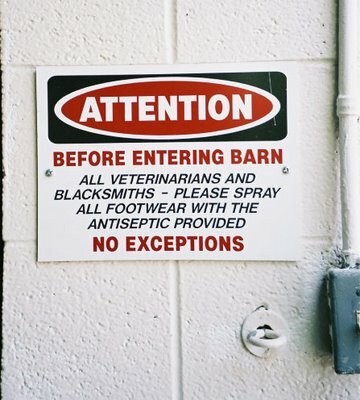 I saw this sign in a Thoroughbred farm's barns in Paris, Kentucky recently. Notice that this is a mass-produced sign. Are these seen in other parts of the world? Other places in the USA? 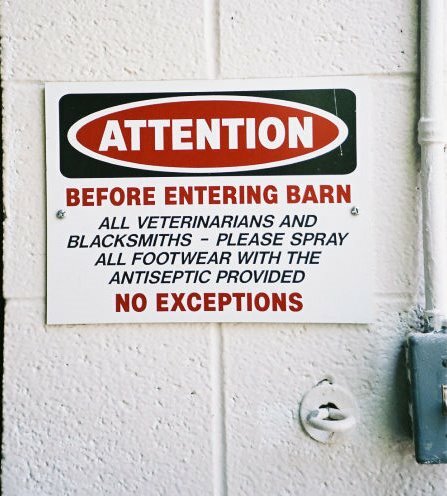 I had only seen signs like this (and not "storebought" one, at that) in equine hospitals until this spring's trip to Kentucky. The funny thing was that the farm did not have a sprayer, it had a wet mat. I guess no one has manufactured a sign for wet mats yet. One of America's "living legends" of horseshoeing is in an uncharacteristic position: horizontal! Marshall "Buster" Conklin of Horseheads, New York is a legend of the horseshoeing world, and one of the most vital, energetic senior farriers in the world. 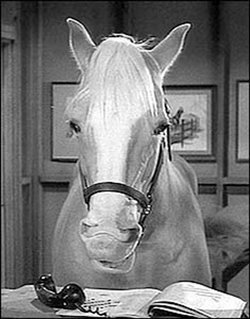 Word has reached the Hoofcare & Lameness office from Michael Wildenstein, farrier instructor at Cornell vet school, and from Steve Kraus, farrier at the Cornell research farm, that Buster has been in the hospital in Sayre, Pennsylvania for the past week or so, and that his liver is failing. Buster was set to have a routine gall bladder removal but his liver reacted. I am not sure how old Buster is--I think he is 80. 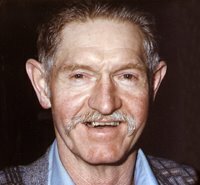 He was--make that is--a legendary farrier in New York state and is retired from the job of farrier instructor at Cornell, which is where I met him in the early 1980s. He is a strong, kind, skilled, and generous man who is a friend to all and a great horseman. I honestly cannot imagine Buster in a hospital bed. He gave a demonstration just a few weeks ago at a fundraiser for the estate of his friend, New York farrier Vern Hornquist, who died last fall. I received this message from Steve last night (see below), I hope that many of you will be able to take a minute and call or write to Buster. Buster has been gravely ill for the past two weeks, with complications from an obscure liver disease which he had a problem with about 30 years ago. He was hospitalized and had some work done to relieve the situation, but it is suspected that he is terminal. He actually is doing better this week, but the situation is irreversable. He went home and will probably be under care of hospice. No one knows how long he has, but knowing Buster he will choose his own time. You can call him; he likes visitors and phone calls. His number is 607-739-2992 and his address is 989 Ridge Rd; Horseheads, NY, 14845. All we can do is pray and support him. Please forward this to anyone who would want to know about this or e-mail me any one who wants to be put on this distribution list. Handmade Horseshoes’ Lucy Diamond Completes Badminton Horse Trials on Her First Try! 3 MAY 2006--LUCY DIAMOND is a busy lady. 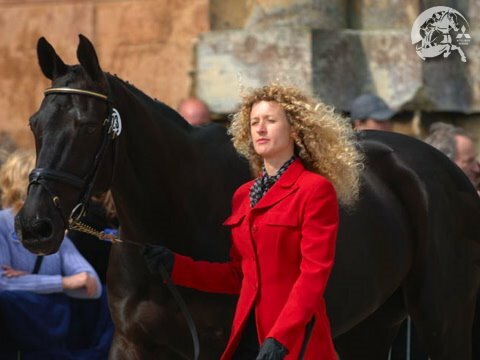 Not only is she one of 25 first-time riders at the Mitsubishi Motors Badminton Horse Trials****, she is also one of just five British owner-riders, has a trade stand here with her husband, the farrier BILLY CROTHERS, and is also a working mother with a two-year-old child. And she has achieved her life-long ambition of riding at Badminton with her first horse. “I hadn’t even been eventing when I bought him and eventing is still just a hobby,” said Lucy, from Leighton Buzzard in Bedfordshire. Lucy has aspired to compete at Badminton since she first came to the event as a child. “It’s been a ‘pie in the sky’ dream and it’s fantastic to be here – I have to keep pinching myself.” Her partner the big, brown, good-looking gelding Carousel was acquired as a five-year-old through Owen Moore and was originally bought out of Ireland from Goresbridge Sales by eventer and dealer Vere Phillipps. The 15-year-old Carousel known as Sooty, is believed to be by the great Irish sire Cavalier. “He is an amazing horse and really honest. How many people get to Badminton with their first horse?” says Lucy. Lucy is married to the four-times world champion farrier Billy Crothers, winner of the prize here last year for the ‘best shod horse’. Billy and Lucy run their own company ‘HANDMADE SHOES’ selling English concave steel horse shoes. For this weekend however Lucy will allow herself the luxury of concentrating on the job in hand. “The course lets you in nicely but there are plenty of big questions out there. I would love to produce a clear round, that would be incredible”. HOOFCARE & LAMENESS POST SCRIPT: Lucy finished Badminton on her first try! Amazing! She ended up in 47th place; only 53 horses out of the original 97 were able to finish. Badminton is widely regarded as the world’s toughest three-day event. Just qualifying for Badminton is a great achievement but to finish is divine! Well done, Lucy! By the way, 2005 World Champion James Blurton won the Best Shod Horse Award this year with Regulus, ridden by Polly Stockton. Lisa Simons Lancaster Survives Vet School! Lisa Simons Lancaster PhD DVM poses minutes after receiving her DVM degree on 6 May at Michigan State University College of Veterinary Medicine. Lisa is a frequent contributor to Hoofcare & Lameness Journal and recently agreed to join our board of consulting editors. She plans to return to her former practice specializing in hoof rehabilitation. 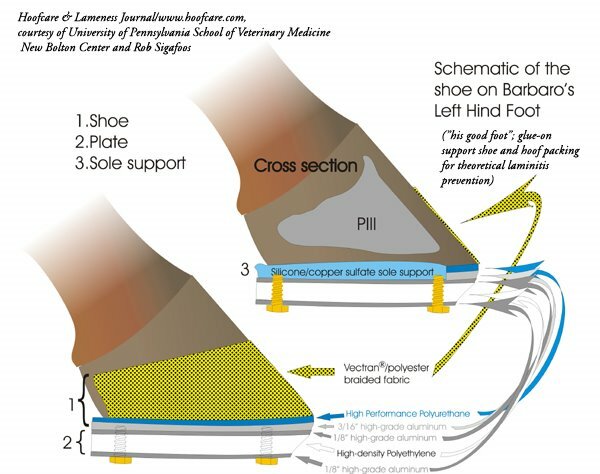 Lisa is the author of the popular new book, The Sound Hoof, and has been conducting research in histological studies of the laminar junction of the hoof in the Equine Foot Laboratory at Michigan State with Dr. Robert Bowker. It was a pleasure to be present at the ceremony. Congratulations, Lisa! You can download a pdf file of Lisa's Hoofcare & Lameness article about the conflicts between Strasser and traditional hoofcare theories on the homepage at hoofcare.com/. plus one 16-page b&w photo insert; price is $24.95 plus $5 post. You can order it from Hoofcare & Lameness, of course. But what matters is that you order it and READ it. To understand where the horse world is today--and particularly racing--it is so important to understand the past. 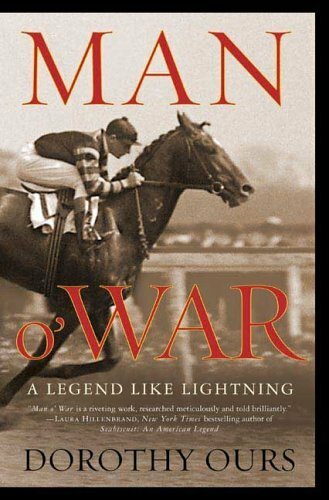 Man O War has been heavily recommended by Seabiscuit author Laura Hillenbrand. Dorothy once lived here in the Boston area; she then moved to Saratoga, where she worked at the National Museum of Racing, and helped me with an article about Battleship's bar shoes, which are on display in the museum. He ran (and won) wearing a sort of half-heart bar shoe. 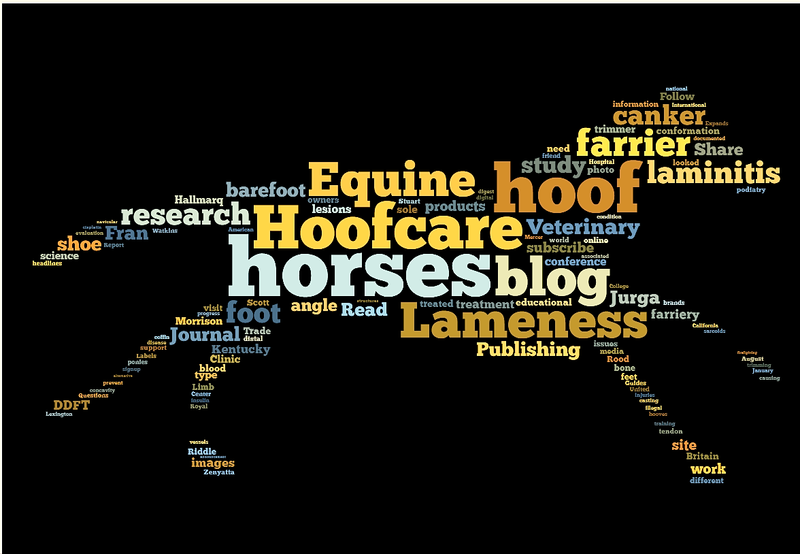 Hoofcare & Lameness Journal has been named a finalist in the annual awards from American Horse Publications. At this time, it is not known what the award is, or what it is for. The award will be presented on Saturday, June 24 at the AHP Awards Ceremony (a.k.a. "The Equine Oscars") at the Grosvenor Resort in Walt Disney World, Florida. Hopefully I can be there to accept it. H&L has received a total of 20 AHP awards since beginning publication in 1995. Sadly, we report the death of Merrill Smith, a kind friend. Merrill is known to many Hoofcare & Lameness subscribers as the wife of Allen Smith, one of our consulting editors. I wish I had a photo of her, but I can't find one. I had a special relationship with Merrill because of her love for sailing; she even liked Gloucester. (This town is one of those places you either love or hate.) I remember so well how excited she was, sitting on our dock, when she and Allen purchased their first boat, a Tartan 10. (as in 10 meters) We shared a sailing coach, an affection for black dogs, and I always enjoyed her delicate take on sailing and Gloucester harbor. She would have loved a day like today. You never know who might answer the phone...We are here to help you with address changes, renewals, new subscriptions, book orders, or whatever you need. The best time to call is between 11 a.m. and 6 p.m., Monday through Friday. If you prefer to fax--always a good idea for orders--that number is 978 283 8775. Or send an email to fran@hoofcare.com.